Contactless payments are a wonderful thing. After some initial apprehension towards the idea of swapping my travel card for a bank card, I've been won over. I won't go back. However I haven't fully graduated to buying stuff with a smartwatch or a running watch, where things like the bPay Loop add-on has made it much easier to do. The prospect of entirely ditching the wallet or carrying a spare fiver still scares the heck out of me. It's like leaving the house without your keys or your phone. It's going to take some time to feel normal. Maybe it has something to do with the idea of relying on just one device to bail you out when you're gasping for some water or in desperate need of a chocolate hit. Maybe when it's possible to literally pay for anything with multiple items you wear, then I might be convinced to leave the wallet behind. It feels like we are finally moving closer to the possibility of that happening. Last year, a report suggested that contactless payments would rise from less than $35 billion worldwide to a massive $95 billion in 2018. That's a whole chunk of change right there that doesn't actually involve physical change. It's highly unlikely things will pick up from traditional wearables alone, like the fitness tracker or the smartwatch. Wearable tech is diversifying in a big way whether it's clothes or a necklace you wear around your neck. It's only going to help make it easier to make purchases with anything you can throw on in the morning. So, who's helping to spread the contactless payment love? All the payment big guns including Visa which made a pretty big announcement recently, signalling its commitment to bringing wearable tech payments to the masses. What did Visa have to say then? It's teaming up with IBM to make it possible to buy things with more of your wearables, smart home devices and cars. Visa will be using IBM's Watson IoT platform to allow developers add mobile payment technology to devices and also talked up the prospect of a pair of shoes embedded with a chip that alerts runner's fitness tracker letting them know how many miles they've logged and when it's time to buy a replacement pair. Has anything turned up yet? Yes it has. Courtesy of the crazy place that is SXSW, Visa has been showing off a pair of payment-enabled pair of sunglasses. Awesome. How do they let you pay for stuff? The glasses, which are made by a local Australian brand called Local Supply, feature a small contactless card provided by startup Inamo which sits on one of its temples. 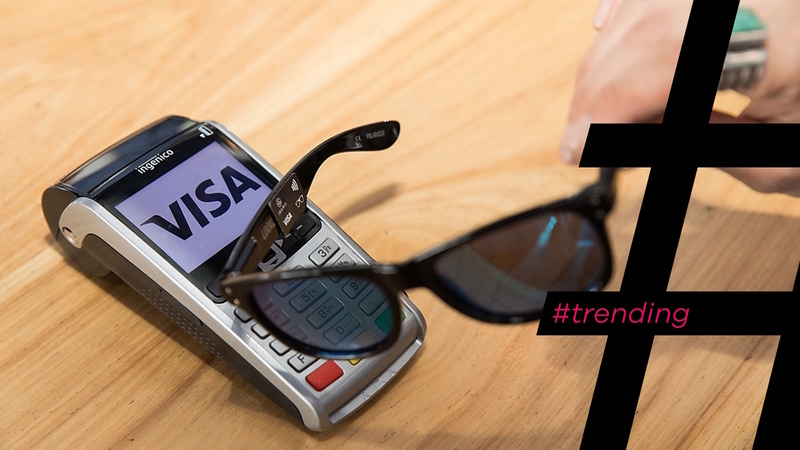 To pay, all you have to do is take the glasses off and tap them onto a Visa NFC-enabled terminal. It's as easy as that. Not just yet. They are still a prototype for the time, but Visa is testing them at the Quicksilver Pro and Roxy Pro surf competition in Gold Coast, Australia, to see if there's a demand for them. Damn. Anyone else bringing payments to wearables? Mastercard is at it as well and Barclaycard's bPay chip is increasingly finding its way into more wearable tech, like the new range of contactless payment jewellery and hybrid watches, which were revealed recently at MWC. It is because they'll incorporate a new smaller and bendier Barclaycard bPay chip that means it can slot into curved, gold and silver finish costume bracelets and the leather straps of analogue watches. Can we get out hands on those then? Hopefully very soon. Some of the bracelets will be hitting UK high street shops including Miss Selfridge and Dorothy Perkins. This is all great news. But can we talk about security? That's a good point. When you turn more wearables into walking wallets, what if someone gets hold of them? This is a fear that has been reflected in Vocalink's 'The Millennial Influence' research report, which suggests millennials are fretting paying for stuff with their smartwatches and smartphones. The same report also suggested that there were concerns about the reliability of transactions. Nobody wants to walk up to a terminal, pull out their shades and get that odd look from the cashier when it doesn't work before you rummage around for your purse or your wallet. We share those similar concerns, but we're confident things are going to get better.